I read so much about individuals shooting coyotes out to 3-4 even 500 yds but man my percentage on a shot at 200yds is low, how do they do it....crosshairs move way too much for me... Thinking I might go to a 3x9 circle X type scope...currently using a 4x12 bushnell elite multi X ... Thoughts? Try a bipod . Ever since I started using one I never looked back. I even use one when I go deer hunting. It's worth a try. Like the ones screwed into the forearm...permanent style mount? I use the ones that screw on were your sling would go. I have the 27" that tilt and swivel . Harris makes them. X2 with the bi-pod. I have one on my Ruger M77SS .270Win with the scope zeroed at 200M. Be sure to get a bi-pod that swivels,so,you can set up quickly on uneven,frozen ground. There's a couple of different makes and sizes. It'll depend on how you want to set up a watch or blind or whether you just want to sit against any background with whatever camo you're using. I don't think you will see much difference between a bipod and shooting sticks in hunting situations, that being said, I've only used a bipod and not shooting sticks. I use a Harris bipod - it's good quality, easy to attach to the rifle and I can get decent results target shooting, but I don't find it practical for the type of hunting I do. They come in certain height ranges, so one that is good for prone shooting is generally useless for shooting from a seated position. I also don't think switching from a multi-x reticle to a circle-x reticle will make any difference. Shooting from the prone position with some kind of rest (bipod or backpack) is a very stable position, but might not be practical when you are hunting coyotes in the middle of the winter. I doubt you will be lying in the snow facing exactly the right way when the coyote appears, and the coyote probably won't give you enough time to adjust to a prone position. 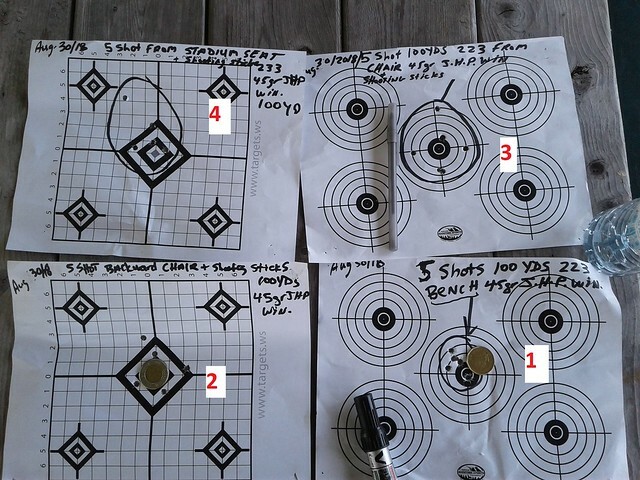 Shooting beyond 200 yards is tough from the seated position unless you have something very solid to rest your rifle on. Last year I set up one of my portable deer hunting stands in a spot where 200 yard + shots were possible. It has a shooting rail at just the right height for those long shots. I tried stabilizing my rifle on it and I found that I was able to keep the cross-hairs very still. Unfortunately, the only opportunity I got for a shot involved a buck running at full speed after a doe, so I passed up the shot at that distance. I've heard good things about the Bog-pod (a tripod), but I've never used one myself. It's not been suggested, and I don't know if you have already done it. Try different brands and weights( 45, 52, 55 grain) to see if there is one that works better then the rest. If you reload or have a friend that does you can really dial in your rifle. Worst case is you get lots of range time and become a better shooter. Forgot to ask what your rifles trigger weight is? If it's too high, you can jerk the rifle when it breaks. Last edited by Snowwalker; August 1st, 2018 at 07:04 AM.